Every year, IGD convenes top African and global CEOs and senior executives for the Frontier 100 Forum. The Forum provides a platform for participants to discuss business and investment in Africa, particularly focusing on how the power of business can be harnessed to promote inclusive growth. This fall, the Forum will be in Washington D .C from Oct. 19-21, 2015. Africa is a continent on the move. This Fall Frontier 100 Forum celebrates the dynamism and growing importance of African business — not only on the continent — but also in the global sphere. The rising influence of homegrown African businesses in the global economy reflects the changing realities on the ground. In 2014, Africa accounted for 9 of the world’s 15 fastest-growing economies. Some 26 of Africa’s 54 countries have achieved middle-income status in a short period of time. This rapid progress and growth have ignited a greater interest in Africa as an investment destination, as increased foreign direct investment and multinational corporations expand across the continent. Today, African businesses are emerging as the drivers of growth on the continent. These born and bred African businesses now create more than 80 percent of jobs in their countries. Localentrepreneurship is on the rise and has become an avenue for gainful employment on the continent. Like many emerging economies around the world, African countries still face challenges to fostering strong business environments. The lack of regulatory environments, skilled workforce, and access to finance often make it difficult for many SMEs to flourish. Yet, a growing number of African business leaders are overcoming these bottlenecks to build some of the fastest-growing companies through creative, innovative approaches, leveraging technology, and sheer ingenuity to succeed. Their success on the continent, and in the global economy, challenges the common misconceptions evoked when discussing Africa’s business landscape. Recognizing the significance of African businesses, the Forum’s theme is “African Business in the World-Class Space”. Panel discussions will highlight successful African companies and delve into how more African companies can become competitive in the global economy. Participants will explore the continent’s ever-changing business landscape, looking at new business trends such as leapfrogging technological advancements. 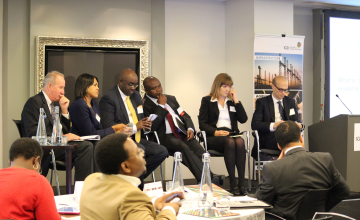 Other session topics include investment from both African companies and foreign investor’s perspectives. The Forum is an invitation-only event, held biannually, one in Africa and the other in the U.S. It brings top African and international CEOs and senior executives together to discuss issues on the continent and how business can tackle these problems. Previous Forums have focused on issues such as standardized power purchase agreements, logistics and transportation, and shared value business models.